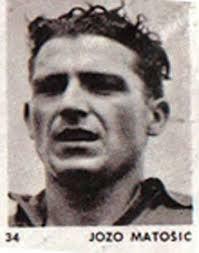 Jozo Matošić, long-year captain of Hajduk and representative defender, was born in Split 27.01.1913. Since 1931. until 1946. Matošić played 471 matches for Hajduk, scored 53 goals, 24 times he represented national team. For the Yugoslav national team debut on 01.04.1934. in friendly match against Bulgaria in Belgrade (2:3), from the representative jersey is retired, also in Belgrade vs Romania 22 of September 1940. in the Dunav Cup (1:2). With Hajduk won the Championship in season 1940-41 of Banovina Croatia. and Championship Public Republic of Croatian 1946. year, and as coach in 1952. year with Hajduk won the championship of Yugoslavia. For some time he held the office of the Secretary General of the club. The holder of the Golden Hajduk captaincy. He began his career at Hajduk 1931. as a goalkeeper. Upon arrival between "white", he went on a tour of South America as the first reserve goalkeeper Bartul Čulić. But on the tour is the legendary Luka Kaliterna imposed him on left defender. In a representative career, one in Istanbul 1936. he fit between the goal and to replace injured goalkeeper Spasić. From this period for all time is remembered victory against Brazil national team 8:4 in Belgrade. Here's how Jozo in the Balkan Cup 1934. was described by former coach and former player Bane Sekulić: "This is the hero of whom the opponent's players refused as the rocks. The hero who arrives everywhere and all overtake. Steel Jozo, our best sideback on Balkanic and pillar of our defense." Jozo teammate Anđelko Marušić was complemented by a portrait of the words "sovereign government area, springs into the crowd in the penalty area and highly elevated breast refers ball from volley and then send long, long, pass to his wing." These words illustrated Jozo Matošić as a footballer. In 1946. Jozo Matošić returned to work between the goal posts. Force of circumstances was a goalkeeper for four games, and the one he defended the penalty. And in the first post-war match against Dinamo Zagreb between the goal was Jozo. As soon as the match began, Dinamo's always dangerous leader attacks Franjo Wolfl was shot from a cannon, and Jozo refused by volley the ball play from their net. "Oh, what are you doing? - Exclaimed his brother Frane - Today you are goalkeeper, not sideback." Matošić later recalled that after the victory of textile workers in Varazdin with 3:0 "porters threw the jersey to hell ..." and goodbye "Goal". * It is very hard to find information about his height and weight, but from pictures what I saw I belive that Jozo was taller from his brother Frane, and much stronger.